Acte Préalable are to be thanked for these splendid world premiere recordings. This is beautiful music, superbly performed. Even for those who know Polish music, beyond those famous internationally such as Chopin or Szymanowski, Żukowski remains a little-known figure. Even his date of death is commonly given as 1931, when he actually died in Lwów in 1942. He was a teacher and an activist in politics and movements for Polish independence. He was a keen supporter of the Polish language. In addition to his pedagogic work, he was also a choirmaster and pianist. This project is largely the brainchild of Robert Kaczorowski, musicologist, singer and Catholic priest, who has a fine baritone voice (he is heard on all six CDs in this series) and may be familiar from his sterling work in the world premiere recording of Poniatowski’s Mass in F (APO 356). His booklet notes are very informative, but modest about his own contribution. That this music has great beauty is evident from any of the CDs, but its quality is timeless. There are no particular stylistic innovations, and someone critical might point out that it might have been written at any time in the last couple of centuries. It is tonal, frequently very simple, and with no huge technical demands on the singers. After all, it is music for the worship of God, rather than as concert pieces for virtuoso display. Nothing is showy – the beauty lies in the simplicity. Even a non-Polish speaker will note at once the clarity of diction throughout the works. Obviously, this owes very much to the singers, both in the choirs (all-male on volume 3, mixed on volume 4) and the soloists (I particularly enjoyed the contribution of Anna Fabrello, but there are no weak links), but also to the simple elegance of the writing. In prayer, words matter – in more theatrical works, the meaning of the text is too often sacrificed to the incidental charms of the music. Żukowski was a man of very deep faith, and his works are meant in that context. The recordings capture this well – the performances have a genuine devotional quality without losing anything in delivery. Something captured very well, especially in the third CD (APO 347), is the way that faith and patriotism have been – and largely remain – intertwined in Polish life. To be Catholic was not simply a matter of profound devotion and faith, but also a sign of national independence, whether against Tsarist (Orthodox) hegemony or under atheist Russian-dominated Communism. Faith was part of identity, and Polish Catholicism developed a distinctive and rich culture. An important part of this was Marian devotion, if anything even more strongly felt than in Ireland. 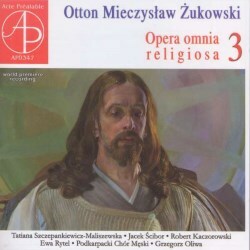 Żukowski reflects that devotion in around half of the pieces here. Some of his most touching and beautiful writing may be found in the second setting of the Ave Maria on APO 354. I enjoyed each CD very much. Each programme has been carefully designed, even though the rcordings were largely made at the same sessions. Today, I find that the CD most enjoyable – by a tiny margin – is the 4th volume, perhaps because it is most representative: tomorrow I may well change my mind, such are the joys to be found in each programme. Overall, then, there are no weak points and much to love as well as admire. Polish music matters and these Cds will give much pleasure.